Clarence Harrison - Almost all of my buildings are made from 3/8” foamcore board. This is basically high density styrofoam sandwiched between layers of paper that you get can get at art and craft stores. 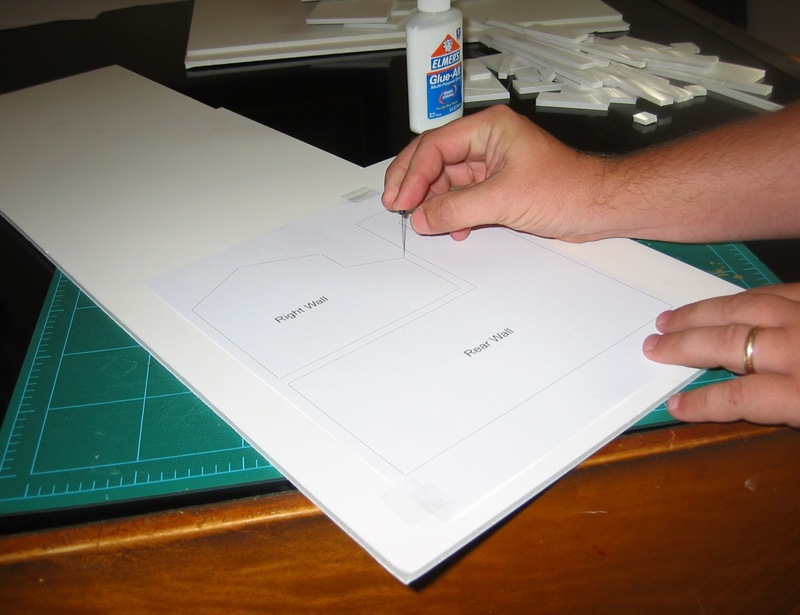 It is durable, easy to cut, and bonds well using everyday white glue. 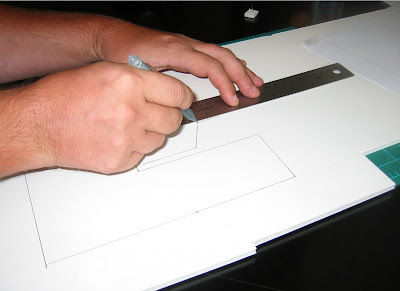 I tape the template to the board and use a straight pin to mark all of the corners, including doors and windows. 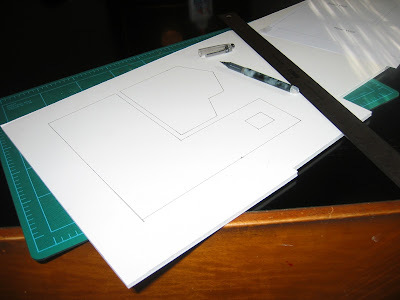 Then I use a ruler and ink pen to ”connect the dots”, effectively transferring my template to the foamcore. 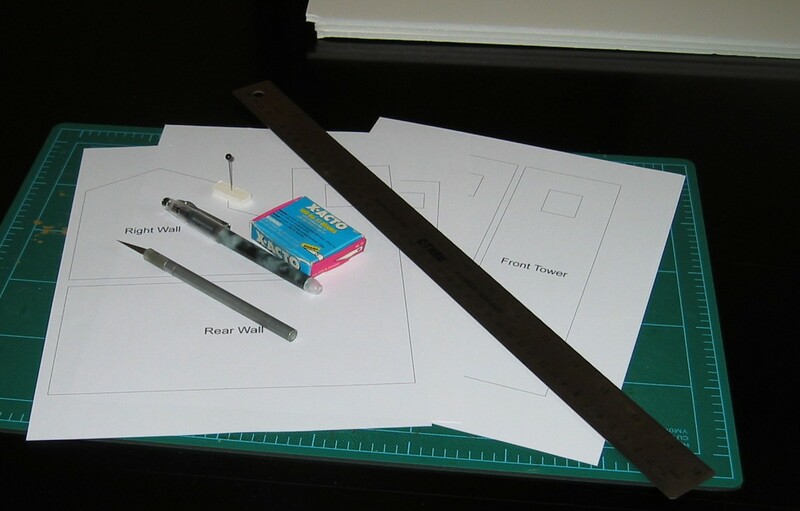 All I have to do at this point is carefully cut out the wall sections. Change blades often as a dull knife not only makes ragged edges, but is prone to catch and skip which might result in a trip to the emergency room! Also, position your ruler on top of the wall section so if the knife strays away from the ruler it does so into ”no man’s land” rather than your wall. Tools for turning the templates into walls. After taping the template to a piece of foamcore, I use a straight pin to mark all of the corners. After removing the template, it’s easy to use a ruler to connect the dots left by the pin holes. The transferred template is ready to cut out. 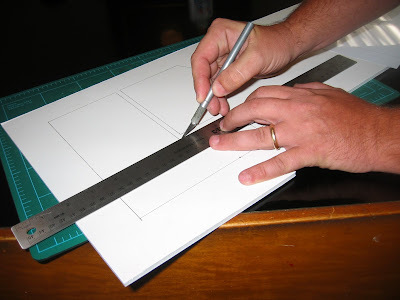 I use a hobby knife and steel ruler to carefully cut out the walls. The walls are ready for assembly! This article was originally published in Battlegames Magazine, but many of the photos were quite small and some were left out due to constraints of the format. 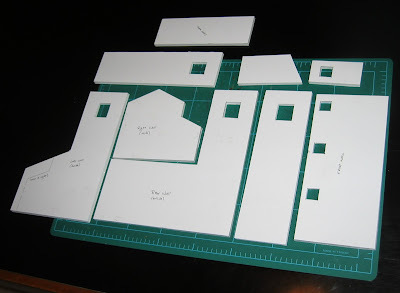 Here we have unlimited room to ramble so I thought it would be a useful addition to the blog as I often get questions on terrain building. This series will focus on a Mediterranean style building, but the techniques could easily be applied to any type of construction.